Mumbai, Saturday, April 7, 2018: Ahmedabad based Expanded Clay Aggregator (ECA) manufacturer and supplier, Rivashaa Eco Design solutions Private Limited, has bagged the prestigious Sustainable Development Accelerator awards at the 2nd Global Business Leadership Forum 2018 here on today. 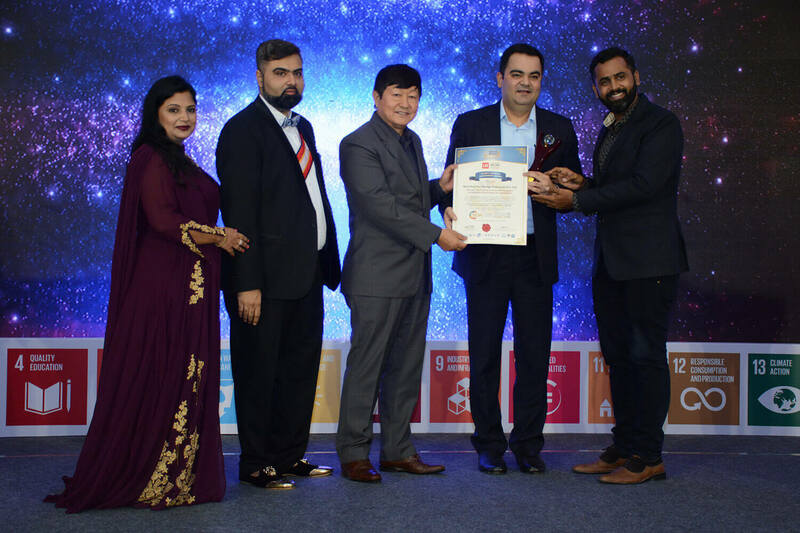 Organised by the World Peace and Diplomacy Organization (WPDO), along with Unified Brainz of India and The Hindu Business Line, the award recognized businesses and business leaders, entrepreneurs, start-ups and peace activists. Models, actors, directors and other professionals from more than 15 countries. Receiving the award on Sustainability, Rivashaa CEO Mr Udeet J Banker said that hard work to manufacture and supply environment friendly Expanded Clay Aggregate has finally been recognized. “The need of the hour is to manufacture such products which are environment friendly and sustainable and Rivashaa Eco Design Solutions Private Limited is committed on this line,” said Mr. Banker immediately after receiving the award. Expressing his excitement, he said, Expanded Clay Aggregate (ECA) is a unique green construction material which is 100 per cent natural and inert light weight aggregate. Rivashaa Eco Design Solutions Private Limited is the first to introduce an indigenous Lightweight Expanded Clay Aggregate (ECA), ECA Construction Blocks, ECA Thermal Insulation Mortar and ECA Thermal Insulation Tiles in India. Dedicating the award to those who are associated with building and construction industry and using traditional and pollutant building and construction materials, Mr. Banker said, “I am dedicating this award to each and every person working in the building and construction industry starting from contractors, builders, architects with a hope that the fraternity will now start using Expanded Clay Aggregate as ECA is environment friendly, sustainable, cost effective, earthquake resistant and which also maintains alkalinity of soli. The chief guest of the award ceremony was Amruta Fadnavis, wife of Maharashtra Chief Minister Devendra Fadnavis. She released a book, World Peace & Diplomacy; The Concept Unfolded, authored by GD Singh, who is founder and president of WPDO.